To begin with a disclaimer, which is probably the worst way ever to start a conversation, I should say that I am well aware of the polarizing effects of coconut. But whether or not you are on Team Coconut, I need to tell you about this cookie, because it emerged from the oven like a beacon of hope after another coconut sugar cookie recipe I'd tried the day before had failed me so. In fact, I don't think I'd ever been so offended by a cookie in my entire life. After I'd chucked the first recipe's printout in the compost along with all of its unfortunate results, I was hellbent on making a seriously terrific coconut sugar cookie all on my own. And with the magic of Christmas, cookie tragedy gave way to inspiration and an awesome Coconut Sugar Cookie. I just love stories of First World problems leading to marginally important successes, don't you? For those of you firmly on Team Coconut, I don't think you'll find another celebration of coconut in cookie form out there quite like this. Not only are we dealing with coconut extract to bump up the flavor, we've got ourselves shredded coconut in two forms, and a dreamy coconut milk icing. It's enough to send you to the islands in the dead of winter, I'm telling you. The base recipe for this cookie is my beloved Heirloom Sugar Cookies, the sugar cookie of my youth, the one I perch on a pedestal above all others. Partly because of its buttery, airy and generally addictive qualities, and mostly because it's a recipe from my Gramma, from whom all delightful things come. To create a coconut sugar cookie divine enough to erase from my mind and palate the horrible nuggets of unleavened suntan oil that came from my first attempt, I figured starting with a perfect recipe was a good idea. And dang, I was right, y'all! It's a Christmas miracle! Dessicated coconut can be found in any health food or natural foods store. Look for regular, full fat coconut milk for the icing (not "light" or "lite" coconut milk) in the Asian foods aisle. You can scoop the dough out for baking immediately after mixing, or if you wish to store it longer, turn the dough out onto a large sheet of plastic wrap, patting the dough gently into a disc and wrapping it well before refrigerating or freezing. Sanding sugar is a coarse, sparkly sugar found in kitchen and baking supply stores. Its endlessly useful for decorating and gives these cookies a pretty sparkle and a nice crunch. If you can't find it, just skip it, or try a smaller amount of granulated sugar instead. Position oven racks in the upper and lower thirds of the oven and preheat it to 350 degrees. Line two baking sheets with parchment or silicone baking mats. Whisk together the flour, dessicated coconut, baking soda, cream of tartar and salt in a medium bowl. Set aside. Whisk together the oil, egg, vanilla and coconut extracts in a small bowl. In the bowl of an electric mixer fitted with the paddle attachment, beat together the butter and sugars until fluffy and pale in color, about 2 minutes. Beat the egg mixture into the butter and sugar mixture on medium speed until well-blended. Scrape down the bowl and reduce the mixer speed to low. Gradually stir in the flour mixture until all the dry ingredients are incorporated. The dough will be very soft. Using a 1-tablespoon-sized scoop, portion the dough into balls into the prepared baking sheets, 12 to a sheet. Pour about 1/4 cup of granulated sugar onto a plate. Dip the back of a measuring cup or the flat bottom of a glass into the sugar, and press onto each dough ball lightly to flatten each to about 1/4-inch thick, dipping the cup or glass again before pressing each cookie. Bake the cookies until they are lightly golden and crisp at the edges, about 12 minutes, rotating the sheets from front to back and top to bottom about halfway through baking. Let the cookies cool in the sheets for a minute before transferring them to a wire rack to cool completely. When the cookies have cooled, whisk together the confectioners' sugar, coconut milk and salt in a small bowl. 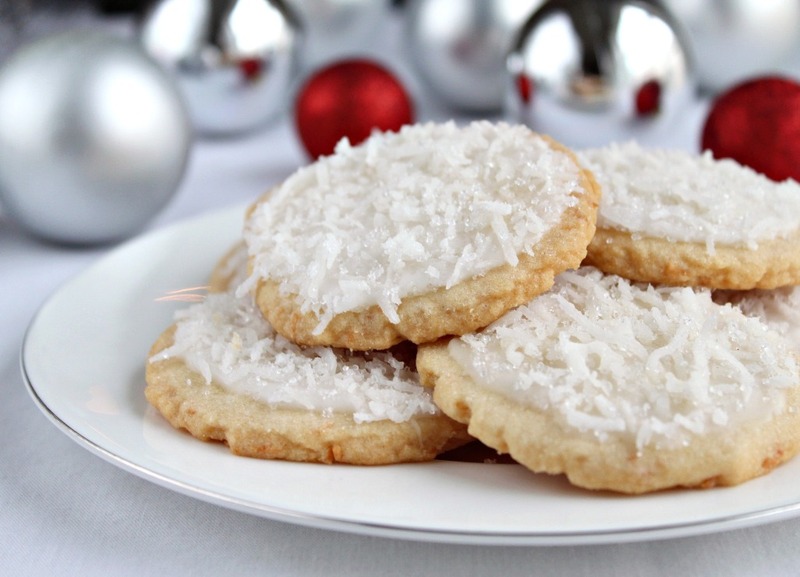 Toss together the shredded coconut and sanding sugar on a plate. 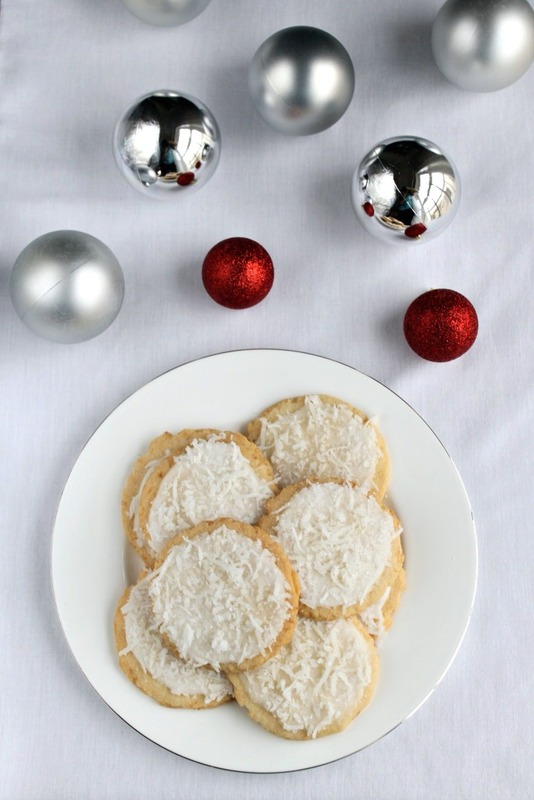 Spread each cookie evenly with icing and sprinkle generously with the sugared coconut. Let the icing dry for about an hour before serving. Store in an airtight container for up to 1 week (the cookies will soften a bit after the first day).